Overwatch just got another hero on the roster, and it is not who the community expected. The name Sombra was spotted in some in-game hints, and it was also mentioned in a leaked gameplay video earlier. So naturally, the entire internet was expecting to see Sombra announced as the next hero. But this is not the case, today we get to meet Ana Amari, a support sniper. 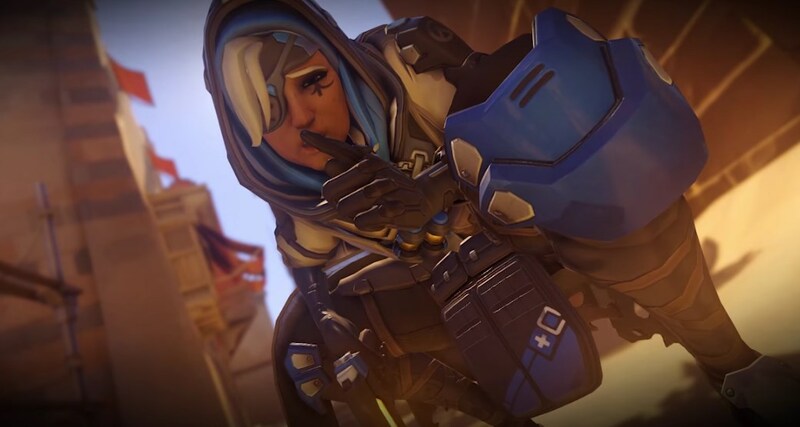 According to Blizzard, Ana is a "battle-scarred veteran who supports her teammates from a distance using a unique and highly specialized collection of weapons." Her main weapon is the Bionic Rifle, as shown in a recent teaser. This sniper rifle heals allies, but it can still kill enemies. The long range heals will come in handy, as well as the benefit of having a sniper on the team if you don't have a Hanzo or Widowmaker. Additionally, she is equipped with a Bionic Grenade and a Sleep Dart. The grenade has much of the same abilities as the rifle, it heals allies and damages enemies within a small radius, but it also boosts healing taken for your team, and blocks healing for players of the opposite team unlucky enough to have placed themselves inside its area of effect. The Sleep Dart will knock opposing players off their feet for a short period of time, something that undoubtedly would be very unfortunate for someone that just unleashed their ultimate ability. And speaking of ultimate abilities, Ana has one of her own, of course. Nano Boost will allow her to hit a teammate with a dart that improves movement speed, damage output and decreases the incoming damage for a short period of time. If you are playing Overwatch on PC, you are able to see how you like thee new hero right now, as it is available on the Overwatch Public Test Realm starting today. The rest of us will have to wait a little longer, but there is no date yet. A good guess would be to look out for Overwatch's panel at Comic-Con, scheduled at Thursday, July 21st, unless we get the details sooner. At least we know that when she arrives, she will be a free addition to the game, just like every future character will be according to Blizzard. Update: Ana's Hero page on the official site just went live, check it out here for more details. What do you think about this new character's weapons and abilities? Have you already tested her in the PTR? Let us know in the comments below. Sombra, Resonance, God and 3 others like this.